There’s something about the noir world that works like a closed system. 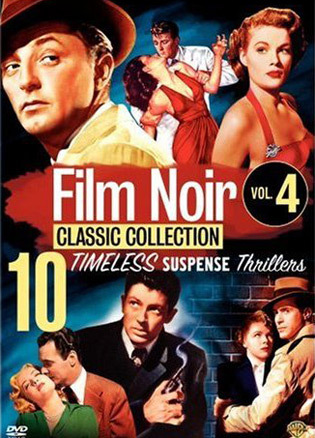 Even in the limited scope of Warner Brothers’ Film Noir Classic Collection (the fourth volume generously packs 10 features onto five discs), the characters, plots and city streets from different movies start to bleed into one grand, mysterious tableau. In 1949’s comedy-noir The Big Steal, Robert Mitchum cheerily greets Jane Greer as she showers in a south-of-the-border hotel room even though she’d just put him through hell in Out of the Past; then, in the markedly more brutal Where Danger Lives (1950), he drives filthy rich widow Faith Domergue back to — where else? — Mexico. This time, Mitchum even has a concussion that explains his inability to learn from past mistakes: “I may talk rationally, but my decisions do not make sense.” Farley Granger and Cathy O’Donnell, doomed lovers in the proto-teen rebel film They Live By Night (1948), are resurrected two years later as endangered young parents in Side Street (1950). By now, noir has extended its reach from hopheads and stick-up men to nuclear families and civil servants; Granger is a postal worker who simply makes the wrong decision about $30,000 that’s just sitting there for him to take. Granger and O’Donnell aren’t the only ones getting more respectable. In Fred Zinnemann’s Act of Violence, Van Heflin is a contractor settled in the LA suburbs, minding his own business (and keeping his own secrets) until his old army buddy Robert Ryan comes to town. His disruptive limping through the middle of a patriotic parade is none-too-subtle commentary in the vein of Robert Frank’s The Americans. (At the film’s end, Ryan heads off to find Janet Leigh — and we think about how the two will resurface, a few years later, to make Jimmy Stewart miserable in The Naked Spur. If a Robert Ryan character wasn’t haunted by his own past, he was making damn sure someone else would be.) In Tension, Richard Basehart is a cuckolded pharmacist who decides to reinvent himself completely, concocting a new identity under which he can get revenge. (Basically, he takes off his glasses and heads to Malibu, so he’s kind of like the “hero of the beach” of Charles Atlas ads, but without muscles.) He’s driven to such measures not only by wife Audrey Totter’s blatant infidelities, but also by her refusal to embrace the American dream. When he takes her to see a plot of land in a suburban development, she stays in the car and lays on the horn. And then there’s the once-virtuous doctor who succumbs to the temptations of wicked Jean Gille, in Jack Bernhard’s low-budget Decoy, which, like Edgar G. Ulmer’s Detour, can’t quite follow the simple formula it seems to be trying for without revealing something else that’s a little unhinged. It’s nearly irrelevant that the plot involves buried loot and the use of methylene blue to bring a gas-chambered convict back to life; what counts is Bernhard’s inability to color inside the lines and screenwriter Ned Young’s inability to let his characters off the hook. In this clutch of films that center on the everyman (postmen, druggists, physicians and vets), it’s fitting that it should be no-name Ned Young who provides a tenuous link from Decoy to the collection’s other masterpiece, Andre de Toth’s Crime Wave. Young (blacklisted and making bank as an actor) pops up as one of a trio of San Quentin escapees (along with Ted de Corsia, a young Charles Bronson and Timothy Carey) who pull fellow ex-con Gene Nelson into a heist. At first, Crime Wave is most remarkable for stuffing each frame with time-capsule gold like marquees, grocery store signs, LA gas stations and a painting of Fraser’s The End of the Trail. Also notable is its prediction of noir’s artier future: Sterling Hayden, here an unsympathetic police detective, would join de Corsia and Carey for another ill-fated heist in Stanley Kubrick’s The Killing. After that, the location sound, handheld camerawork, unfussy set-ups and the near-absence of score are all impressive. But what ultimately sets Crime Wave apart is the way de Toth keeps hitting the brakes of the plot to linger on human emotions: the static Bressonian close-up of Nelson and his wife’s entwined hands on a ringing phone; the wounded look on Hayden’s face as he lights a cigarette; the sad, baggy eyes of a lonely old man. It’s enough to make you forget about film history. It’s enough to make you forget you’re watching a movie.